Bona Fide Records: York Record Riot Returns May 26th With Its Righteous Record Ruckus! We are the gateway to enlightenment. The music that has fallen thru the cracks. Those who should be king and those who will never be king share space with an inside look at the music business through the knowing eyes of a small independent label willing to offend the easily offended and to speak the truth while others spread lies and hype! Got that?? 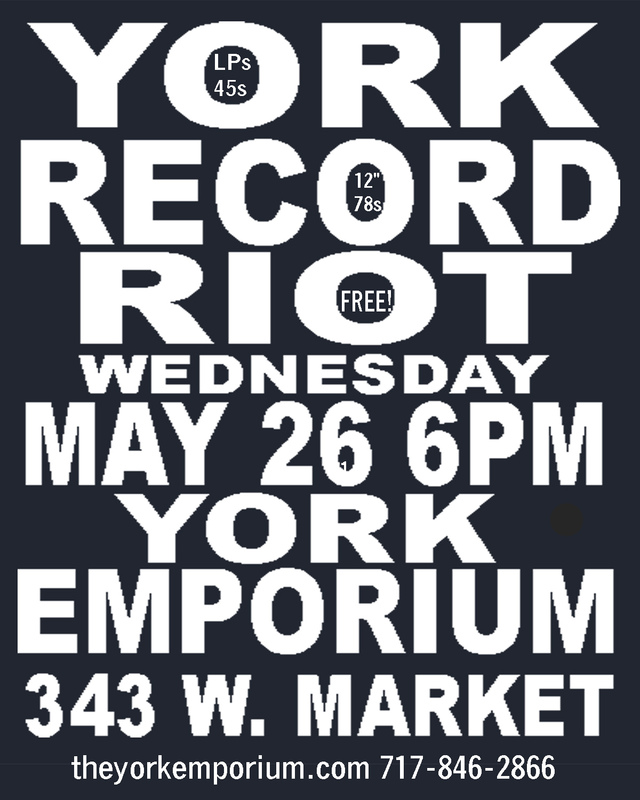 York Record Riot Returns May 26th With Its Righteous Record Ruckus! 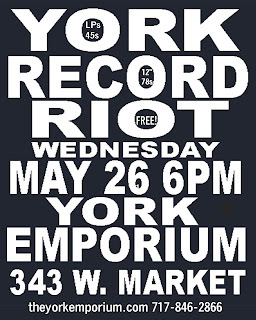 Due to the success of the very first York Record Riot this past February, the decision has been made to have the fun Wednesday night record swap on a quarterly basis, beginning with the May 26th show! Hosted by the multi-tasking, used books and more, warehouse the York Emporium, the first record swap was a blast, well attended and a quite cozy event all around. Essentially a wildly divergent group of folks turned up to sell and buy some old vinyl, and even swell out of the area record shops like Mr. Suit of Lancaster and Own Guru of Baltimore showed up with their wares. So the big Wednesday night riot will return in just a few weeks, on May 26th, and it remains a lone oasis of vinyl culture in downtown York, a free event that offers a fine diversion from run of the mill fare, as one can find inexpensive wonders galore and maybe a few worthy expensive ones too. The friendly atmosphere of Jim Lewin's wonderful emporium is a big plus and his wife Pam sure can make some good brownies too! It's like the old days when all the record shows were all sort of informal gatherings, and fun and music was the order of the day. Things certainly have changed since the 45 and the LP arrived on the scene, and some of those artifacts are now valued and treasured. Crate diggers have returned vinyl to its proper place in the scheme of things, rescuing and reissuing lost treasures and giving the artists some long overdue attention. The show at the Emporium again will have a wide range of sellers from all over, and gives the vinyl hungry crowd one little spot where they can browse a traveling record store and rediscover some lost treasures on their own. Who knows, maybe even some of the famous York records will show up, like the Loose Enz, The Chapparals, or the Blues Spectrum! I could only hope, really. Calling all you great central PA bands of the 60s like the Emperors, the Shaynes, The Centurys, the Evil I, etc., dig out your records and photos and bring them down! Things surely will be happening at the York Emporium the night of May 26th. As they say, it's all for the love of rock and roll, or soul, or jazz or hillbilly, etc. Come on down and join us Wednesday night for a little bit of action, good music and good times! Sirius About Music? Not Really. The Left Comes Back With A Vengeance!